Our mission is to improve the competitiveness of our customers’ supply chain by taking time and costs out of the entire procurement and fulfillment system. We analyze the extended value stream from the raw material supplier to the material converter to the original equipment manufacturer to the end-user. We know we can remove wasted time and money throughout your existing processes. How can a compressed supply chain mitigate material fluctations? Does a tighter supply chain improve customer responsiveness? 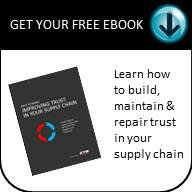 Could a Compressed Supply Chain work for you?